The Ohio AgrAbility program has had a great year working with engineering students at University of Dayton and The Ohio State University. The 49 freshman and sophomores attending the University of Dayton worked on 11 different projects over the past two semesters. These projects emphasized a wide range of health disparities farmers deal with on a daily basis including grain handling, arthritis, access to equipment, and use of hand tools. One team focused on autism and computer technologies to interface with cognitive disabilities. 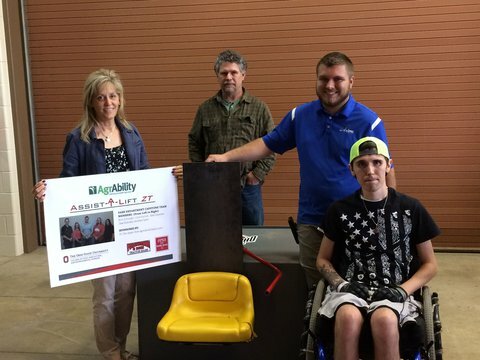 A group of five students at OSU worked together on a year-long senior engineering capstone project to provide an AgrAbility client with an accessibility solution for his lawn mower. 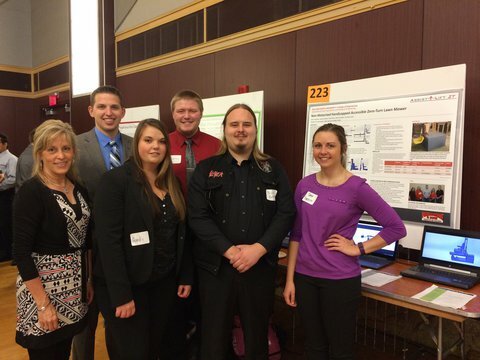 This team presented their final design at a university technology fair (see the group photo). Later that same week they shared their prototype with the client and his family (see the second photo in the lab). It was exciting to learn that their work will be included in a patent that may help others with similar mobility limitations. What great partnerships with engineering programs in the state to support AgrAbility clients. These service-learning projects affect more than students' grades in a class: they impact the families that can put the ideas in motion!